Dollar Shave Club is known for its ads poking fun at competitors like Schick and Gillette, claiming last month to have become the No. 2 best-selling razor in the U.S. Now, Gillette is fighting back with a rather unorthodox approach: turning negative tweets about the startup into ads. And with Dollar Shave Club still perceived as "the little guy," it's not going very well. Over the past few days, Promoted Tweets from Gillette have started showing up in news feeds from Gillette customers who have evidently tried but weren't impressed by Dollar Shave Club's subscription service. One tweet in particular from Ermin Maslic, an account executive at VaynerMedia, raised eyebrows yesterday. The way the situation played out was unusual. In August, Maslic tweeted that he didn't like Dollar Shave Club's products, calling out Gillette. Now, the tweet is running as a paid ad, with some questioning whether VaynerMedia was involved in the stunt. This morning, VaynerMedia's Gary Vaynerchuk responded on Twitter, saying his shop doesn't work with Gillette and that Maslic's tweet was sent before he worked at the agency. Per Vaynerchuk, Gillette asked Maslic to use his tweet, but he was not paid. But the VaynerMedia confusion is just the beginning for Gillette, which is getting all kinds of negative reactions. The social campaign has sparked a ton of backlash on Twitter from users who say the P&G brand's name-dropping ads are too aggressive—showing the risk big-name marketers take when calling out an underdog. 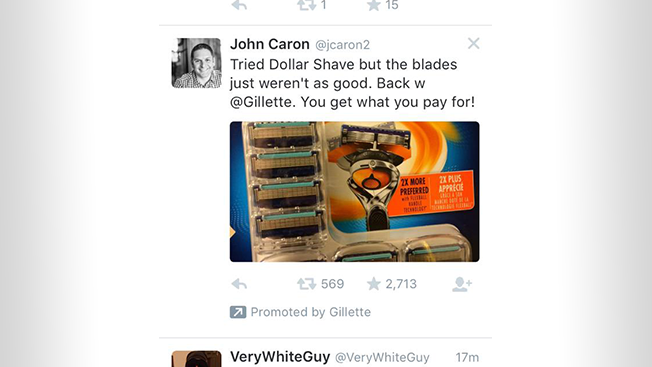 Not enjoying the "battle" between @Gillette and @DollarShaveClub that's happening via ads on my feed. I use neither. Go @SchickHydro! im never buying a @Gillette product again after seeing them pay to promote tweets trolling their competitors like @DollarShaveClub. Really all these stupid promoted tweets from @Gillette knocking @DollarShaveClub have me wanting to give @DollarShaveClub a try. Tried ignoring @Gillette's totally organic promoted tweet campaign about dudes giving up on Dollar Shave Club. Gillette did not immediately respond to a request for comment, and Dollar Shave Club declined to comment on the campaign. Regardless of whether any of the people who tweeted about Dollar Shave Club were compensated by Gillette, the razor brand's campaign is an interesting use of social conquesting. Typically, brands are stealthy when going after their competitors, but Gillette's efforts suggest that marketers are willing to get a bit more aggressive, especially on social media, if need be.